On a 1-2 pitch to McCann, Sale tried to set the mark with an eephus—a high blooper ball—but the pitch drifted well inside. Sale (13-11) said the idea came into his mind after talking to members of the LaRoche family, including Dave, who threw a "La Lob" during his career and is the father of Chicago first baseman/designated hitter Adam LaRoche. ''You have to have fun in this game,'' Sale said. And it was for me, my buddy Dan, and the other 18,000 who braved a very cold fifty-one degree evening. 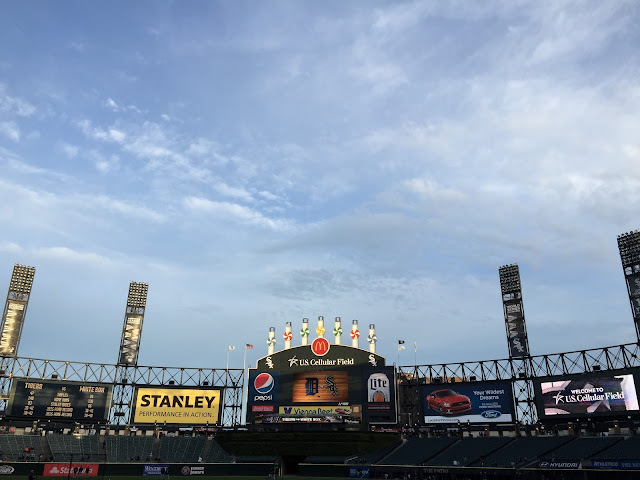 A sharp and constant wind blew all manner of detritus around the field—napkins, wrappers, plastic cups, at one point a paper plate on its side for a dramatic roll from the first-base line to the Sox dugout along third. 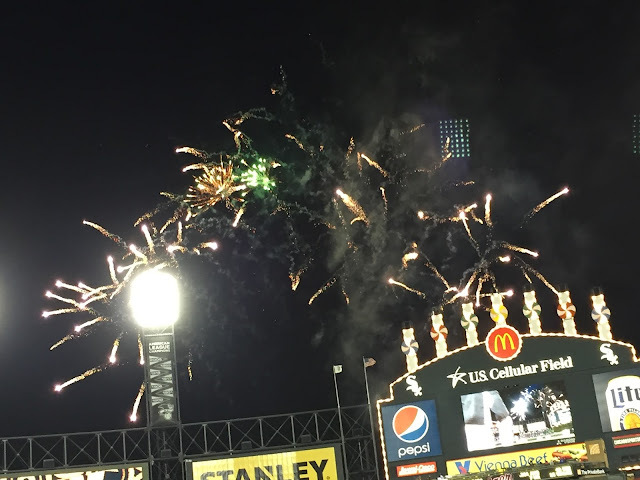 Yet the 2-1 Sox victory was played crisply. The game was over in a taut two hours and thirteen minutes, highlighted by a couple of loud doubles and sterling defense from both teams, including a terrific diving catch by Sox right-fielder J.B. Shuck in the seventh. But the chill underscored the melancholy, the fun tempered by the fact that this was my final game at the park until next season. We'll watch another off-season of front office machinations that may or may not improve the team's chances to catch the legit Kansas City Royals—and the inevitable new scoreboards are coming, too—but regardless of the odds, I'll be here next year as soon as I can, raising a beer to the game I love. 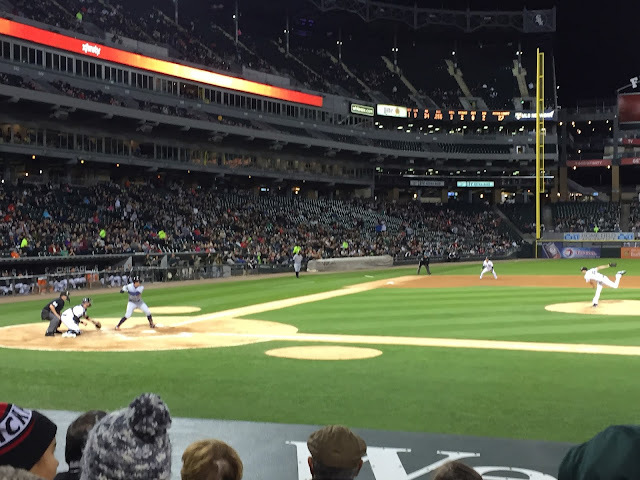 I came out in July to watch Sale attempt to become the only pitcher in MLB history to throw nine consecutive games with ten or more strikeouts; he fell short that day, but the rough weather held off until after the game. 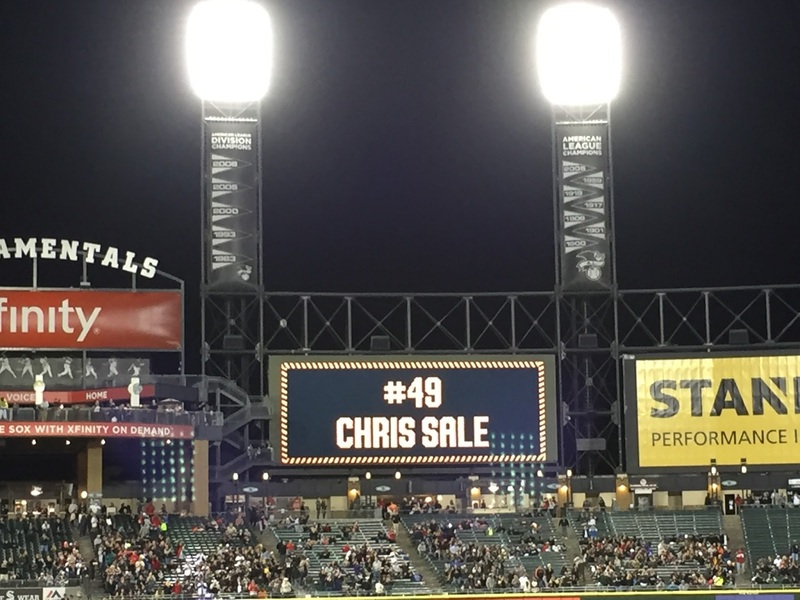 This time, Sale prevailed against the elements, and provided the fans at U.S. Cellular Field an historic and exciting October moment, rare these days. "You tell me what it means."